To wrap up the week, here are a few images of yet another building we love- the iconic Sydney Opera House, originally designed by Danish architect Jørn Utzon for a 1956 international competition. Below are a few of the original drawings submitted for the competition over half a century ago. Over the next decade, the design went through numerous iterations to develop the structure behind the large shells, or sails, as many refer to them, with an innovative design solution using pre-cast rib vaults. 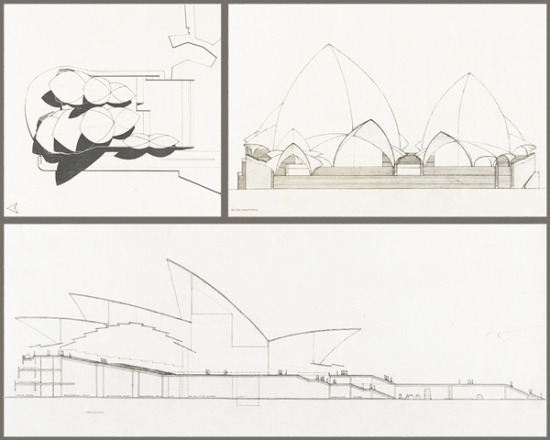 However, in 1965, a new government elected, which ultimately led Utzon to resign as chief architect and leave Sydney, never to see the Opera House completed until he finally returned in 1999 to develop design guidelines for expansion and future renovations. Since the Opera House is usually photographed as seen from the water, I thought I'd share a few from our own photo library that give a better sense of the actual human-scale experience of the space. In fact, some observers feel that the 'sails' are better viewed up close, and I have to agree- I didn't fully appreciate the design until I had the chance to see it in person... so hopefully these images can help convey the monumentality of this beautiful work of architecture.